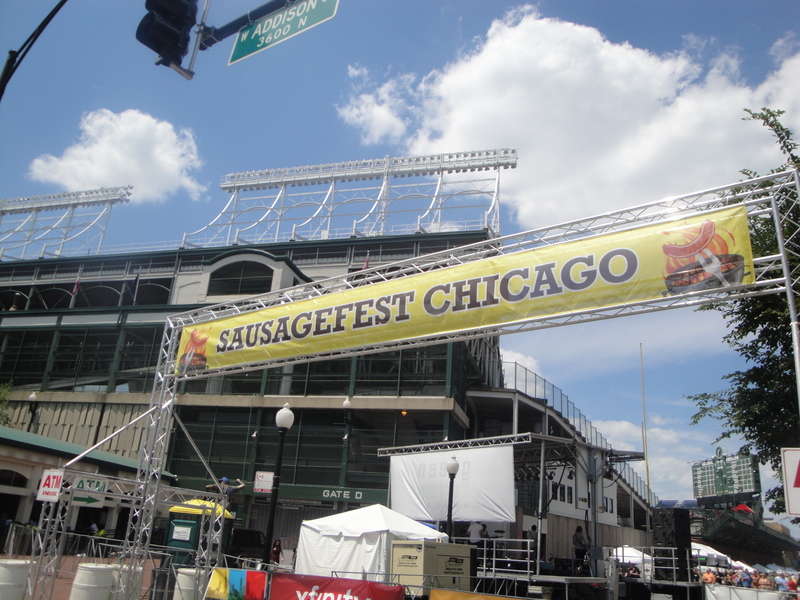 Chicago Sausage Fest in Chicago lies in the shadow of Wrigley Field on Sheffield Avenue. 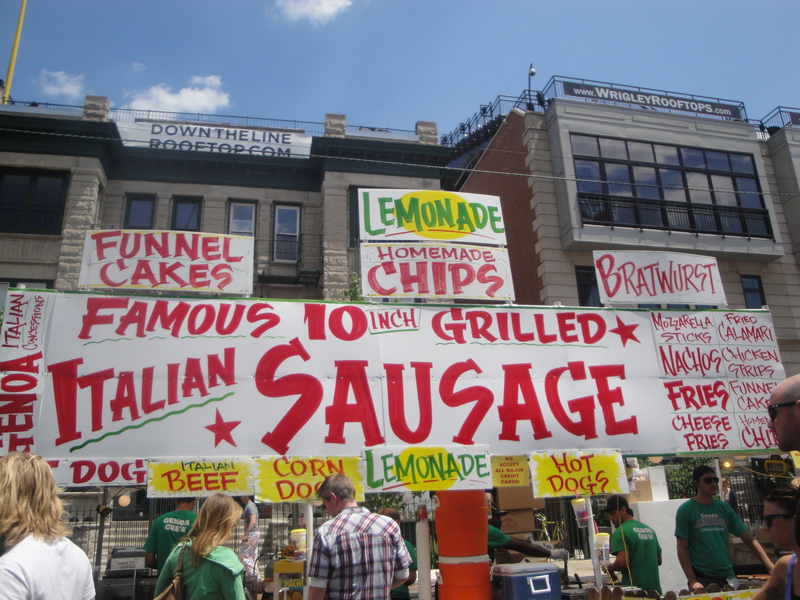 I came here last year in 2011 and sampled sausages from the Dog House, but this year I had my eye on catching up with the Haute Sausage Food Truck. 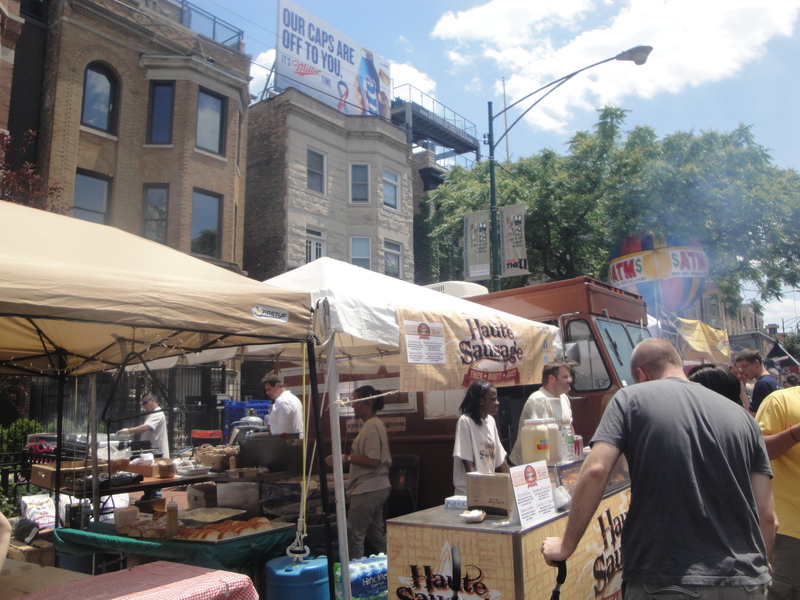 I have had sausage from this truck before, but as the current law prevents the Chicago Food Trucks actually cooking on their trucks, I was really looking forwards to getting my hands on one of their freshly cooked dogs. I was not to be disapointed. 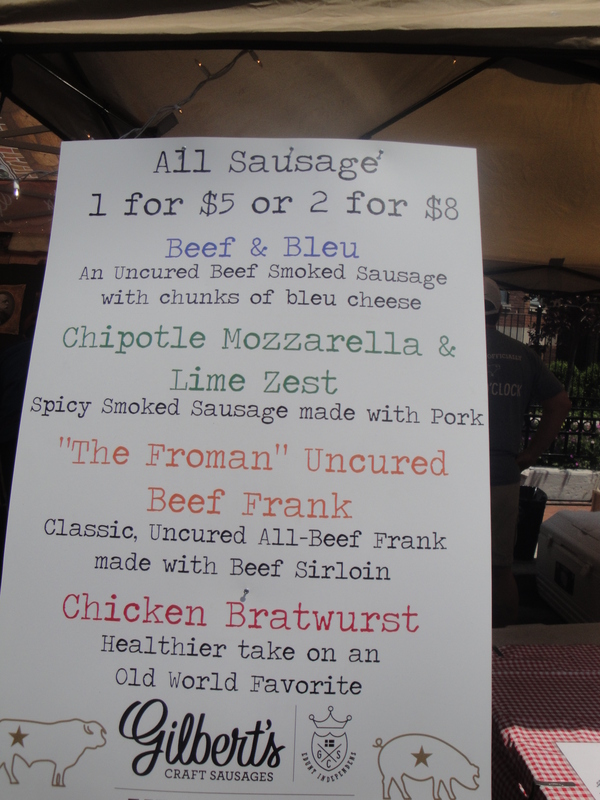 I was quite torn by which sausage to sample. 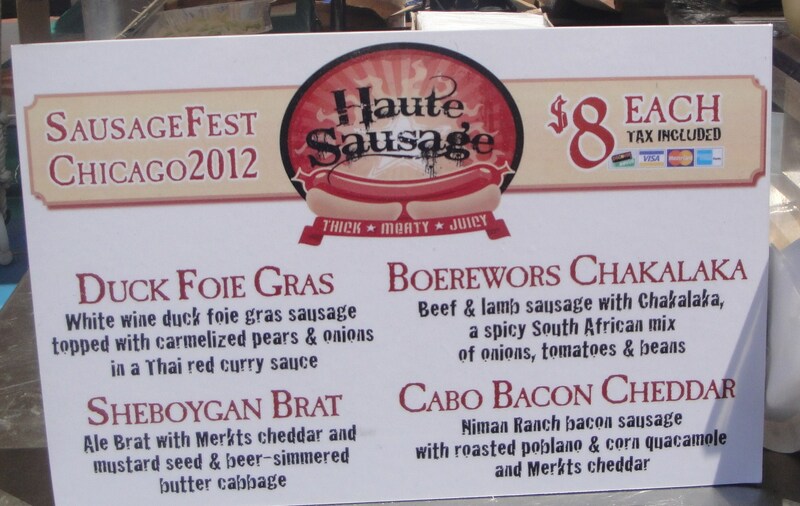 I have had the Chakalaka and the Sheboygan Brat before, and I was really tempted to try them again, but the word ‘bacon‘ jumped out at me and I just had to try the Cabo Bacon Cheddar sausage. 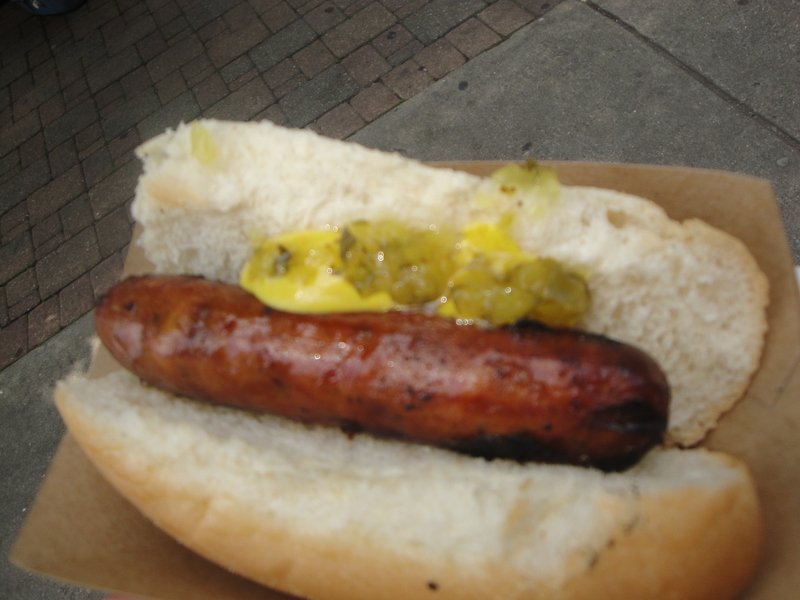 The Cabo Bacon Cheddar dog is a Niman Ranch bacon sausage with roasted pablona, corn guacamole, and Merkts cheddar cheese. It was seriously good. 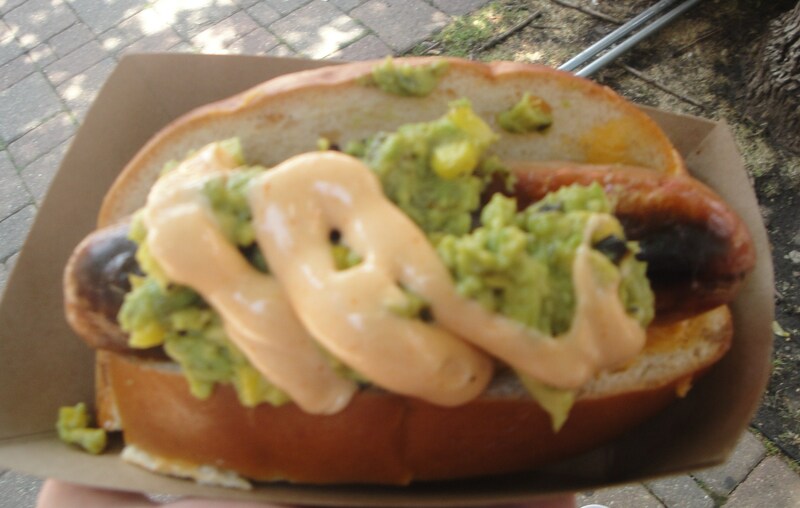 As well as the awesome toppings of the guacamole and mayo, the sausage itself is a joy, both juicy and flavoursome, it was not overcooked and it was wrapped up in a great soft white bun. In the base of the bun was the melted cheddar cheese. I could have eaten a bun just filled with the cheese on its own, it was that tasty. 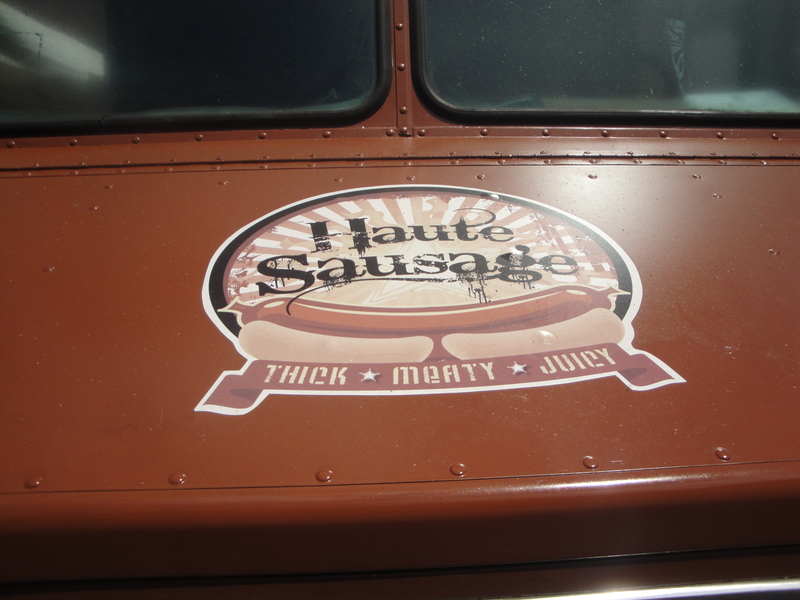 Haute Sausage are online at http://www.hautesausage.com/ and you can track them via twitter and facebook. After washing this sausage down with a crafty craft beer I figured that I had enough room for just one more sausage. After some serious contemplation and wandering in the sunshine I found myself in front of Gilberts Craft Sausage Stall. I was instantly drawn towards the Chipotle Mozzarella and Lime zest option this was the ‘Catalana’ a spicy smoked sausage made with pork, mozzarella cheese, chipotle peppers and lime. In contrast to the first sausage I sampled this one had all the flavours encased within the beast. I could have eaten a whole lot more sausage, but I figured that I would stick with what I had found, why eat more just to look back at the first one you had eaten and say that they were not as good. 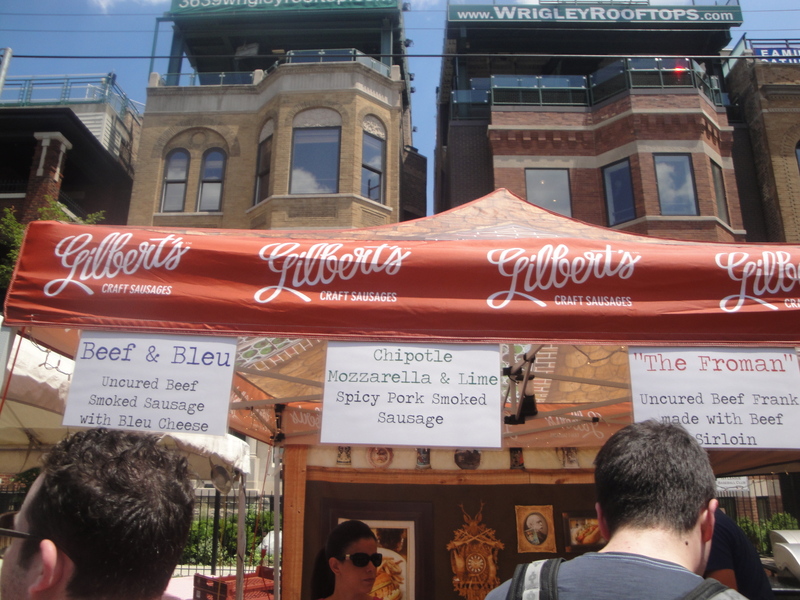 Thanks for coming out to Sausagefest, and glad you liked our Chipotle/Mozz!